Isaac Clarke’s name comes from two of sci-fi’s most gifted and well-known writers, Isaac Asimov (I, Robot. Bicentennial Man) and Arthur C. Clarke (2001: A Space Odyssey). He uses a variety of futuristic engineering tools as weapons. Why we love him: We love him for what he isn’t. He is not a typical ‘hero’ type. He’s not a soldier, he’s a mere engineer, who ended up on the wrong ship at the wrong time, but can still adapt to the horror that he is about to encounter. One of the creepiest aspects of the series is the fantastic use of setting. The first game is based on the USG Ishimura, a mining ship that has been radio-silent for some time. As you explore this derelict ghost-ship, and Clarke’s mind starts playing tricks on him, thing really start to feel a little spooky. The second game is set on the much larger space station called ‘The Sprawl.’ It’s slightly less isolated as the Ishimura, but still as atmospheric. The third game is set on a variety of fear inducing locales. Why we love it: The locations really exacerbate the emptiness and desolation of Isaac’s situation. The story within the Dead Space universe is full of sinister people, religions and artifacts who all seem to have a hidden agenda. I won’t go into detail for the benefit of those who haven’t yet played the games (hint: go and play the games), but needless to say, our poor old engineer, Isaac, seems to have gotten himself muddled up in a conspiracy of epic proportions. Although you spend most of the game fighting necromorphs, they are really only the tip of the iceburg. Why we love it: The twists in the plot and the depth of the characters create a world of despair and paranoia that few games can match. A poster advertising RIGs . 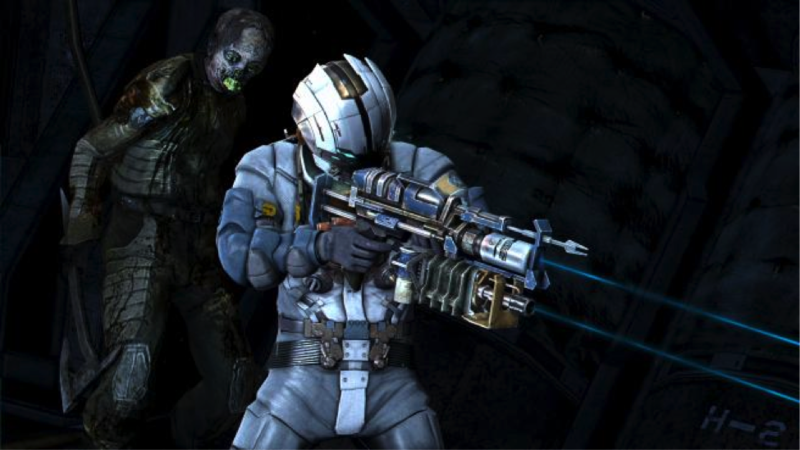 Resource Integration Gear, or RIG is the outfit Isaac and other NPCs wear in the Dead Space environment. The green light that runs down the spine (and changes from yellow, and then to red as it decreases) monitor the health of each individual. The more lit up it is, the healthier you are. There are different suits you can obtain, with different attributes and they can all be upgraded to give increased stats such as oxygen supply, resilience or strength of kinesis. Whatever you’re wearing, each RIG shows your health, stasis module power, a navigation system that draws a line to your next goal, and holographic projections of your inventory, map and notifications. Why we love them: Not only are RIGs cool, futuristic suits but they also do away with the need for HUDs, making the whole screen environment a more realistic place. 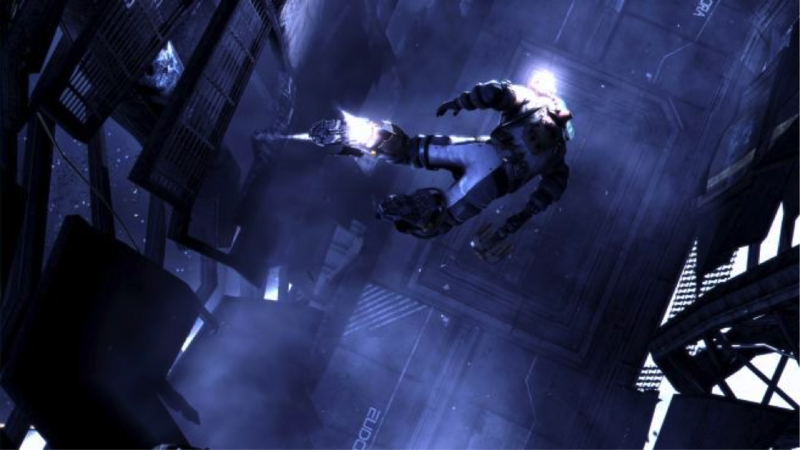 Dead Space 2 brought a new gameplay element to the table – multiplayer. Players join teams and battle it out human vs. necromorph, swapping roles after each round. 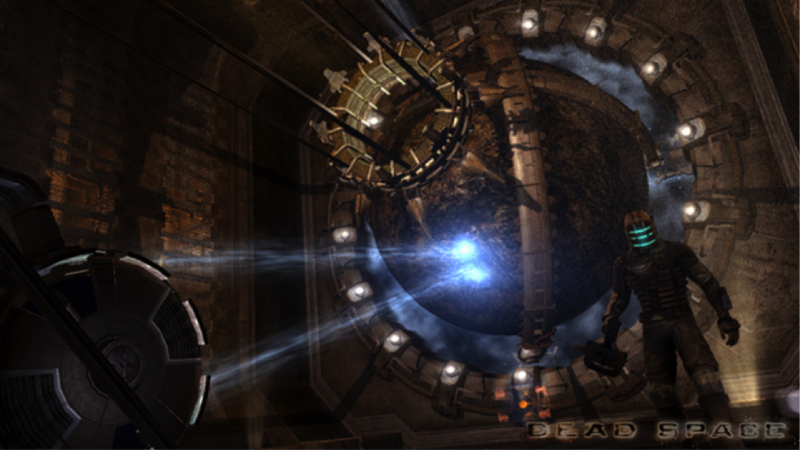 Dead Space 3 also introduced an online co-op mode. Why we love it: With the removal of the isolation comes the removal of the horror, but the fun is multiplied ten-fold. Necromorphs are the reanimated bodies of the dead in the area. Brought back by the mysteries behind the markers, their one true goal is to make more of them, by destroying any living organisms they can find, so they can come back as more necromorphs – they’re space zombies basically, and Isaac’s biggest obstacle in all the games. They come in a number of varieties depending upon the tissue they are animated from, allowing for some pretty cool boss levels. Why we love them: Anyone who still chases you when you’ve shot off their arm and both their legs is ok in my book. You’ve gotta respect that level of determination. Unlike the regular Earth zombies you and I face every day, a shot to the brain will not instantly kill the cosmic undead quite so easily unfortunately. Instead, limb dismemberment is the way to go. Shoot off their legs, and they’ll slowly crawl to you grasping at you with their arms. Remove the arms and all they can do is run and bite. Three or four clean limb removals should do the job to destroy them. Some necromorphs can regenerate limbs, salamander style. I’ll let you work out how to destroy them. Why we love it: There’s something uneasily satisfying about destroying an organism piece-by-piece. Headshots show style and finesse, limb removal shows manic and possibly psychotic behaviour. Embrace it. There is a nice collection of well-rounded, multi-functional weapons in the Dead Space Universe. And best of all, many of them aren’t really weapons – more futuristic power tools, which suits Isaac’s engineering background perfectly. Take the plasma cutter, a simple laser-(well, plasma)-cutting tool, with a button to switch from a horizontal cut to a vertical cut. Hmm, sounds perfect for arm and limb removal. Many other weapons are stronger and suit different needs, but this is your bread and butter weapon. You even get a special achievement if you complete the first game using only this weapon. Why we love them: The futuristic epitome of ‘Dad’s garden shed.’ Break in, steal his tools, see what they do. Luckily Isaac knows how to use them. Every aspect of the Dead Space series has been built for one reason - to immerse the player in such horror that they don’t want to see what’s lurking around the corner. But are unable to put the game down at the same time. The setting, the lighting, the sounds, the characters and story, and of course the aliens all combine to deliver a genuinely chilling experience. Why we love it: The attention to detail is marvelous. The lighting is positioned and rendered in real-time so that you will literally jump at your own shadow. Quicktime events in video games are quite often cheap, tedious, laborious slogs that don’t do anything for the atmosphere of the game. In the Dead Space series, however, some of the most memorable moments come from QTEs. Like in the first game, a long tentacle grabs Isaac and you have to shoot at his abscess enough times before he drags you into his lair and rips you into pieces, or in the second game, there’s a certain sequence involving your eye. I’ll leave it at that for now. Why we love it: A game sequence that is becoming more common and more tedious actually works quite well in this series and adds to the horror, rather than taking the player out of the zone. What Do You Love About Dead Space? 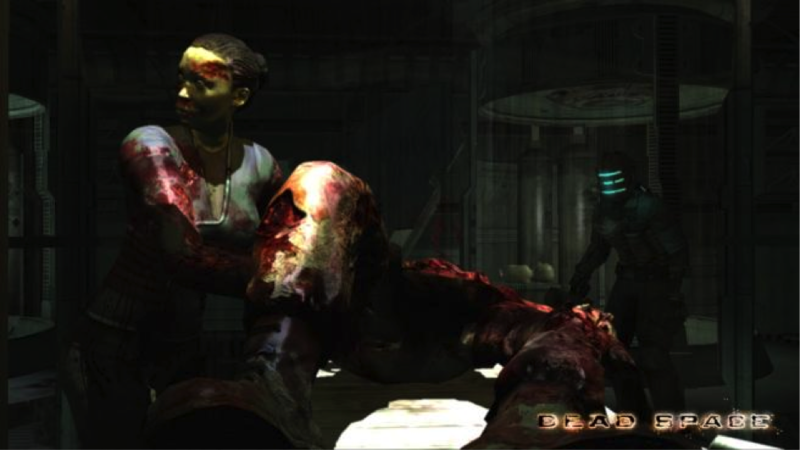 The first Dead Space created a stir and got itself a bit of a cult following and reputation. Dead Space 2 was by far the most successful of the games and quickly spurred the release of Dead Space 3. However, the latest release did not do so well in sales and although not regarded as terrible, was generally regarded as lacking something the other two (main) games had. However, as a series, along with the comics and movies, we have been immersed in a deep, rich and genuinely terrifying world that will hopefully produce a fourth instalment. While we wait, check here for some other cool sci-fi games to play.